Wednesday November 12th 1894 I was busy all forenoon with the work and got early dinner. Wills man left yesterday and he got another to husk corn. We went in town after dinner. I started over home and met Mother going up to Folsoms and Mortons and I went along. Will come to the church for me. I got a new fur cape this afternoon. It was nearly bedtime when I got my evening workd done. Election mostly Republican [the following text is written in the right margin of the above entry] wrote to Laura Mason. Thursday November 8th 1894 I got up a nice dinner and cleaned the house up as I looked for Mother but she did not come. It was not cold today. I sewed some on my calico dress in the afternoon and in the evening wrote to Ida Byington. Friday November 9th 1894. The wind began to blow cold late last night and today was very disagreeable. I was nearly all day at the kitchen work. I stored pumpkin and fixed up feed for the chickens in the afternoon. I knit all evening. It was too cold to attempt going to Mrs. Masons funeral. Will and Simon worked a good part of the day putting away turnips &c so they would not freeze. 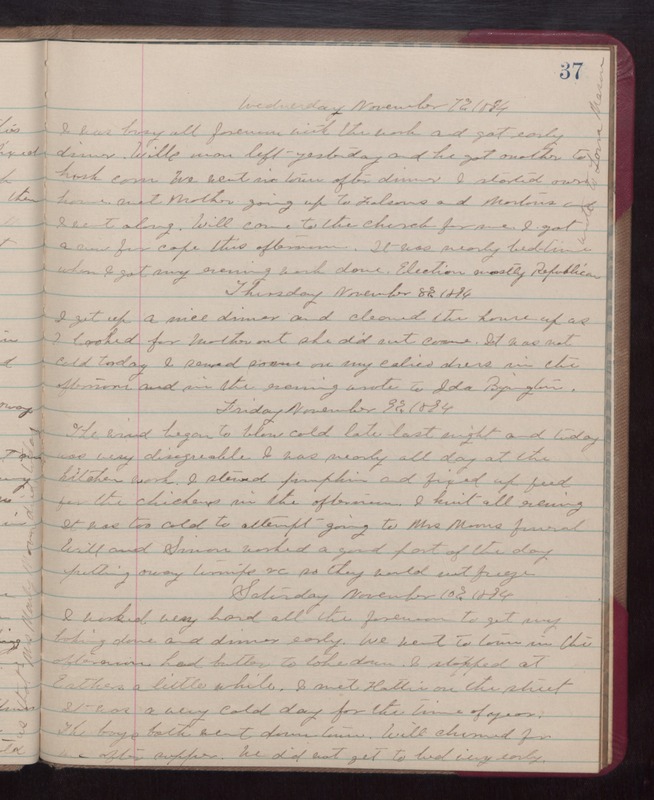 Saturday November 10th 1894 I worked very hard all the forenoon to get my baking done and dinner early. We went to town in the afternoon had butter to take done. I stopped at Esthers a little while. I met Hattie in the street It was a very cold day for the time of year. The boys both went down town. Will churned for me after supper. We did not got to bed very early.